I love this time of year because of all the gatherings that take place. 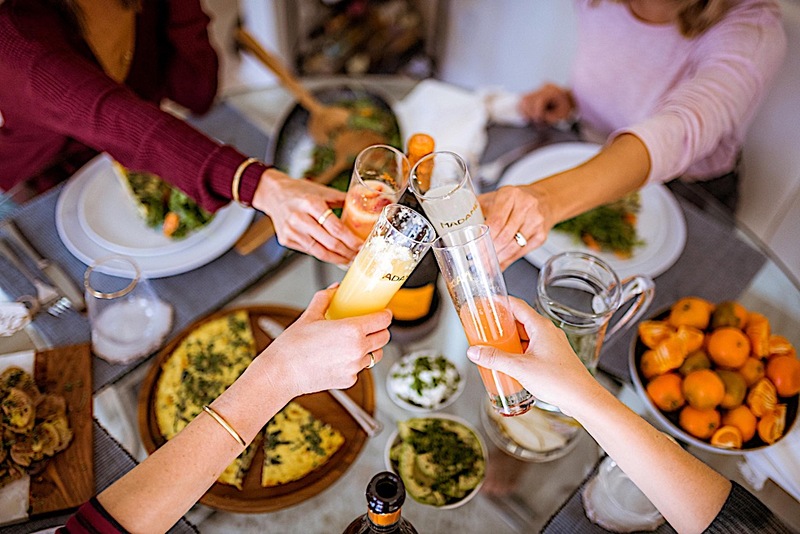 From family, to friends, to co-workers, it is a time of celebrating friendships and gratitude. A few weeks ago I met up with bloggers that I had known only through social media, but felt like I already knew. 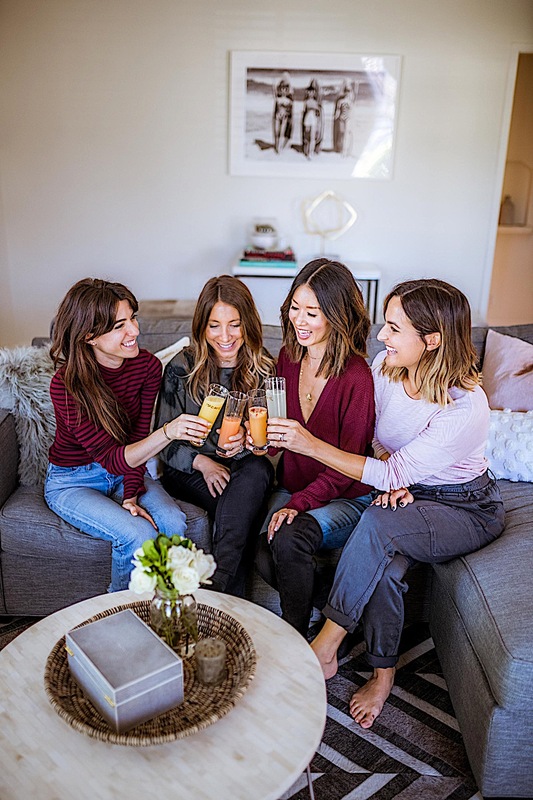 Camille of @charmedbycamille, Kelly of @she_went_west, Natasha of @noshwithtash, and I decided to get together to celebrate ourselves (because why not?) 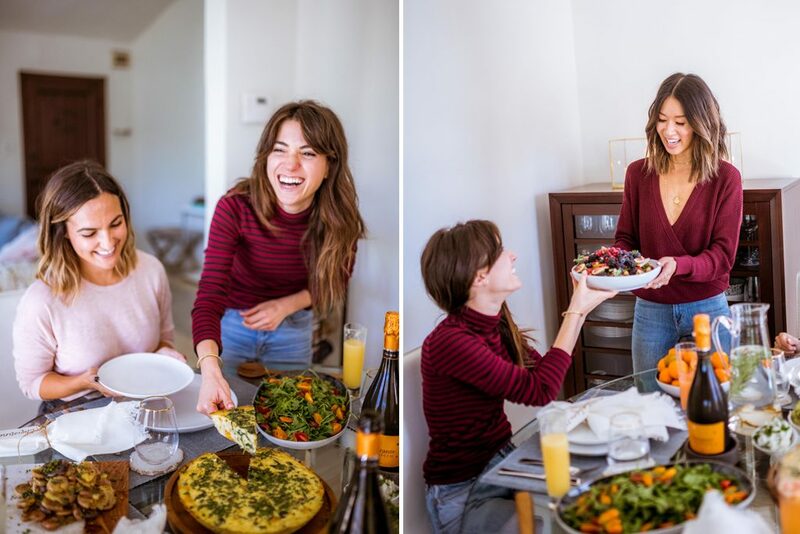 over some amazing Prosecco and delicious food and chat about everything from fashion to family and decor! When it comes to brunch though, first thing is first…mimosas! I personally am not a huge drinker, but who can say no to Prosecco especially when it’s from Italy. 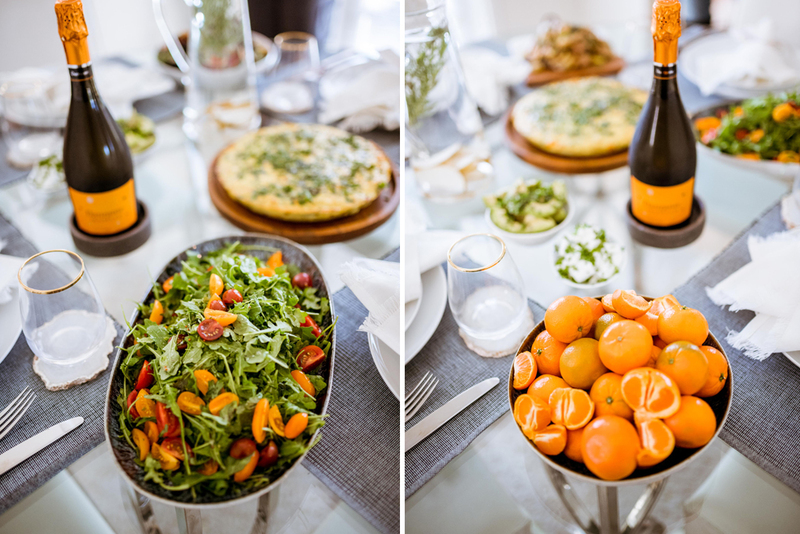 Danzante Wines makes such fabulous Prosecco that pairs perfectly with brunch. I like that it is extra dry with lasting bubbles (which is ideal when entertaining) and has a crisp appealing palate. Not only do I love the taste, I also love the meaning behind the name – Danzante is Italian for dancing and is intended to capture what you will experience when drinking their wines: a feeling of enjoyment, celebration, and being in touch with your senses. And honestly, this Prosecco does just that. 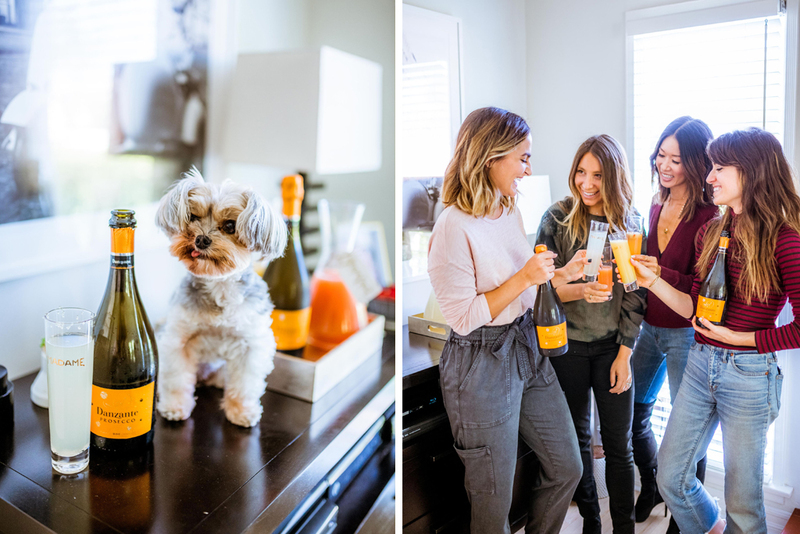 As soon as you pop open the bottle, it really is all about enjoying great wine with good friends and delicious food. Speaking of food, this brunch was extra special because we had our very own Chef Natasha of Nosh with Tash cook for us! 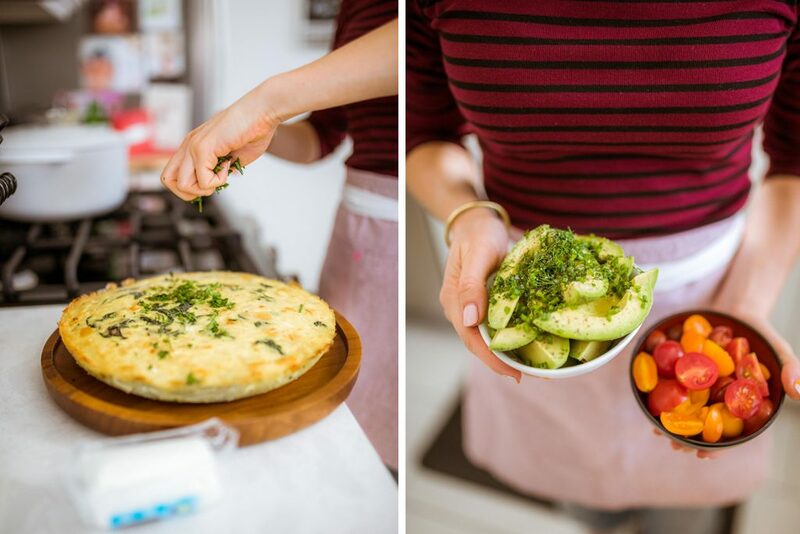 If you haven’t checked out her delicious and easy recipes yet, click here. Not only is her food incredible, she is so funny! 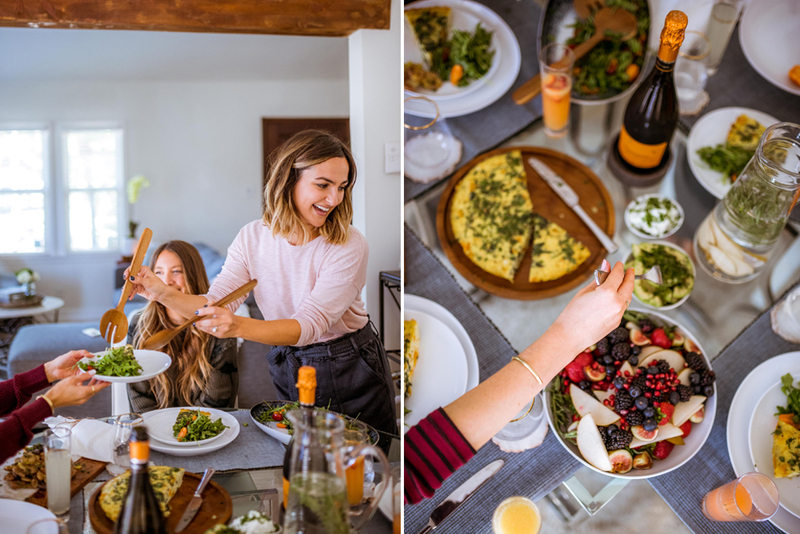 On this particular day, Natasha created a beautiful brunch with the freshest ingredients of local foods from Whole Foods Market. 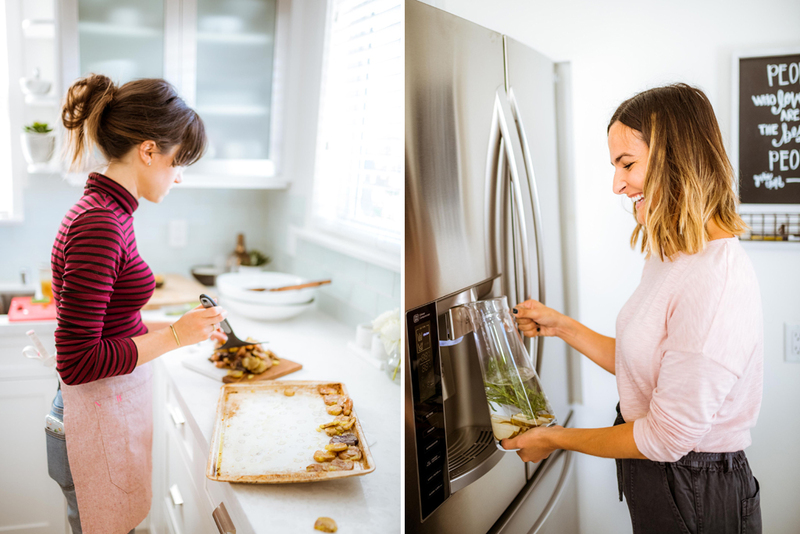 Everything Natasha made was inspired by the color and heart-warming flavors of fall from Whole Foods Market from the arugula salad, vibrant fruit salad, to the butternut squash frittata, to the mouthwatering smashed potatoes. We discovered new flavors, ideas, and favorites from this meal. I literally recreated everything Natasha made a week later (thankfully there is a Whole Foods Market near me) because it was that good and I couldn’t stop thinking about it! Everything tasted so fresh and it was great knowing that not only were we feasting on her delicious recipes, but knowing that the ingredients were locally sourced, fresh, and super colorful made me feel good about eating seconds and thirds too. And what is hosting without having beautiful platters and table settings too? West Elm LA is one of my go-to places to get minimal yet chic, modern pieces. In fact, my casual dining area is completely from West Elm! I love all of their entertaining pieces too including the marble and wood cutting board which was perfect to display the layers of smashed potatoes, the wooden platter for the frittata (which I can also use for a cheese plate), and the organic plates perfect for everyday too. 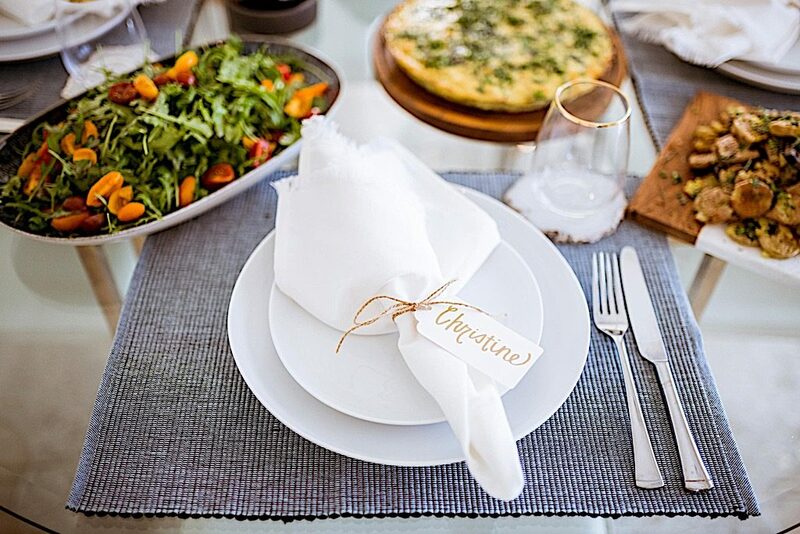 It’s also about the little details like the clear water pitcher which Natasha filled with lavender and pear slices, the stunning agate coasters, the gold rimmed glasses, and the added pop of color from the placemats (all perfect gifts for the hostess too). I literally am obsessed with everything from West Elm and their price point is amazing too! 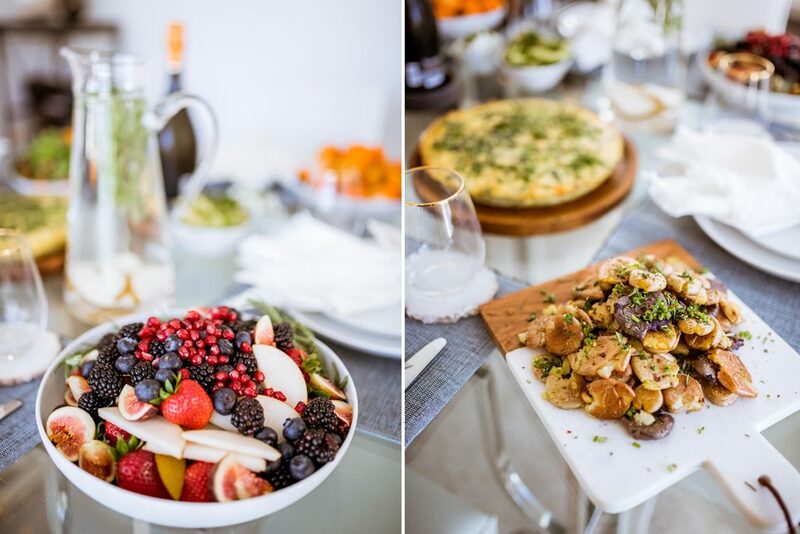 I had such an amazing time at this brunch and loved that it was casual, light-hearted, and fun. Dressing up has its moments but it’s also nice to be able to wear clothes you can move, breathe and eat it especially when there is such tempting food around! One of my favorite casual brands is Splendid. Splendid make timeless, comfortable pieces you can wear forever and that last multiple washes. This reversible sweater is perfect for the holidays and I love that I can wear it two ways (forwards and backwards). I actually ended up unknowingly twinning with Natasha who was also wearing a classic striped Splendid turtleneck. 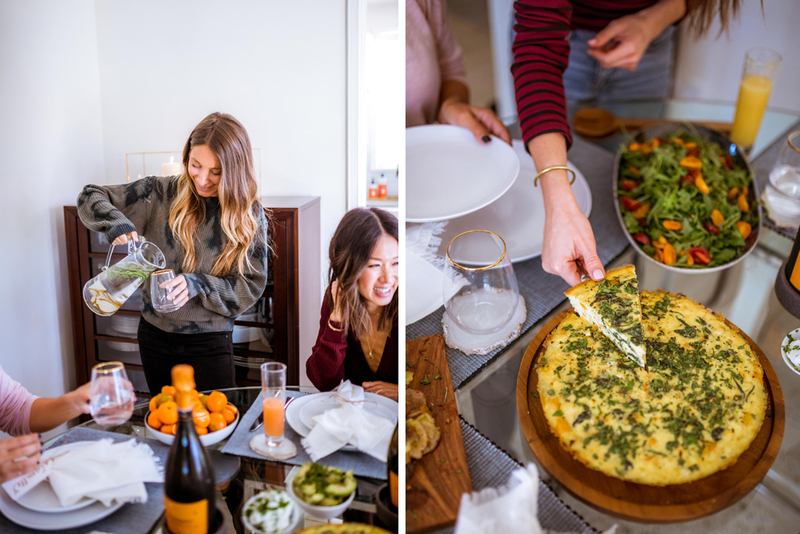 I had such a wonderful time at this brunch learning new recipes with Whole Foods Market, discovering the latest entertaining pieces from West Elm, and toasting to new friendships over Danzante Prosecco. In fact, we had such an incredible time we decided to try and gather together for any occasion we can think of! So stay tuned and if you aren’t following these incredible ladies already, what are you waiting for? Special thanks to Danzante Wines for partnering on this post! This looks so fun! I love hosting events like this! Looks like you ladies had such an amazing time <3 🙂 The food looks sooo delicious! Awwww, this friendsgiving looks so fun and delicious! All the pretty dishes look mouthwatering and colorful. I wish thanksgiving in general was more of a holiday in Japan, I miss it! Girl, looks like you had a wondeful celebration! I’m excited to celebrate friendsgiving with a couple of besties. Love all of the images and the set up is beautiful. The food, the wine, the companie, everything looks perfect. This thanksgiving was so fun and beautiful! Love hosting such events! I am drooling over all the yummy dishes here! Everything is so hearty and healthy too. Prosecco sounds the perfect wine to pair with such a yummy brunch. What a great time to celebrate friendship and gratitude! The table set up is so beautiful and I love West Elm’s chic yet modern pieces. Jordan did such an amazing job taking these pictures. You girls had such an amazing time gathering together. I totally enjoy reading your blog post Christine! What a gorgeous gathering. I love those OTK boots of yours. They are simple yet versatile. The food looks so good and It makes me want to be at thanksgiving right now . This looks really fun dear. Your photos are super adorable, and food is amazing! You all look like you had such a fun brunch. 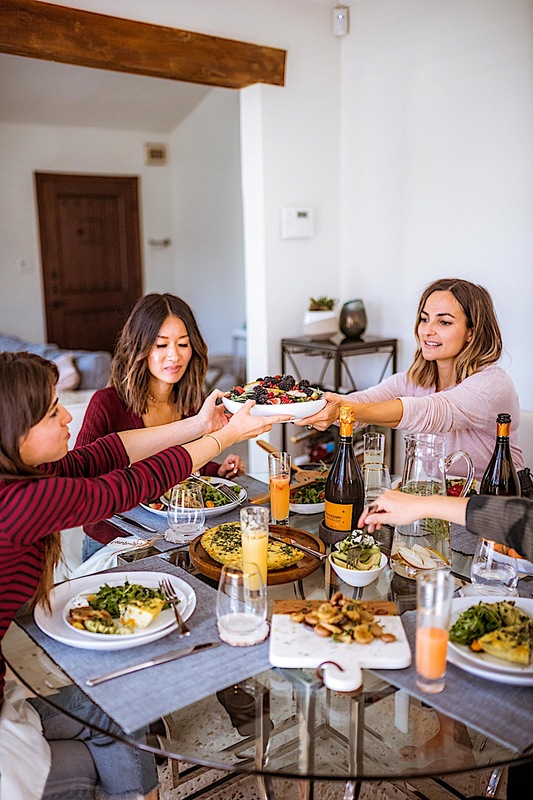 I mean, a time hanging out with friends over food is always a win in my book and it looks like a major win for you all. Happy holidays!!! Wow! This brunch looked like so much fun. And yes, mimosas are definitely a must! Wish I had the time to entertain more. Sounds like you had an amazing time with the girls. The food looks delicious and yes to mimosas! I wish I met you in person too when you were in Vancouver, too bad I had the surgery. Hope you had a lovely time! This Brunch looks so amazing and fun. . Happy holidays! I always love this time of year because it brings people together! I had my Friendsgiving on Friday and it was soo much fun! We didn’t have Prosecco, but we did have Cuvee and Brut. I am a huge champagne fan so I def have to try the Danzante Wines Prosecco. Whole Foods for the win! I buy all my groceries there! So glad you gals enjoyed your brunch! Ohhh i love friendsgiving! Hope you had a great holiday babe!